A cow with a name produces more milk than one without, scientists at Newcastle University have found. Drs Catherine Douglas and Peter Rowlinson have shown that by giving a cow a name and treating her as an individual, farmers can increase their annual milk yield by almost 500 pints. The study, published online today in the academic journal Anthrozoos, found that on farms where each cow was called by her name the overall milk yield was higher than on farms where the cattle were herded as a group. Scientist Live discussed Dr. Douglas' findings with her. What prompted you to investigate whether naming cows led to increased milk production? This was part of a larger study examining the impact of a pleasant relationship between human and cow. I used to be a nutritional adviser to dairy farmers so have seen hundreds of farmers, farms and their herds of cows. There were differences in how the farmers behaved around their cows, and how the cows behaved around humans (friendly / fearful). The study at Newcastle University was designed to see if these differences in how cows feel around humans would actually translate into genuine measurable differences in welfare, behaviour and milk production. Many studies with other animals had found that reducing fear could improve fertility, growth rates, immune response (disease resistance) and improve the ease with which they could be handled. 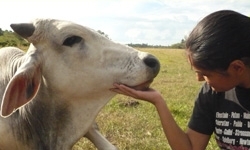 We did not want to provoke fear in our experimental herd, instead we wanted to see if, by improving the relationship with humans (so cows liked human company), we would see improvements in welfare, behaviour and production. The welfare would obviously be good for the cow, better behaviour means they are easier to manage and milk, obviously less stressful for the milker (I have had a black eye and broken ribs from cows distressed at being in the milking parlour, there is also industry data showing the large cost of livestock injuries) and any benefit in production would obviously be good for the farmer. And finally - where did the naming come in? Well, we wanted our study on the university farms to link in with what the best farmers actually did or prove that it was possible to have some commercially feasible good practice associated with an improved relationship between cattle and humans. The survey (to which approx 550 farmers responded) asked for a range of indicators of how farmers interacted with their cattle. Just one of these questions was "do you call your cows by name". Others were do you think they are intelligent / have emotions / do they have contact with a female stockperson (other scientific evidence suggests that cows prefer females). There were about 25 other management / attitude questions. There was no difference in milk yield based on many of these, but there was a significant difference over the question about the name - and a big difference for the farmer - about 3.5%. Farmers chose the genetics of their herd carefully to get good milkers, cows also have a carefully formulated diet to maximise milk yield, but this finding, that suggests that good stockmanship can considerably increase milk yield should be very heartening to the compassionate farmer. How was your study designed and why? We gathered objective production data on milk yield to avoid any bias from respondents self-reporting. We then categorised farmers on whether they had responded that they did / did not call their cows by name and analysed the milk yields of the 2 groups. A statistically significant 258 litre increase in milk yield where farmers reported that they called their cows by name. This is approx 3.5% increase in milk yield. The survey also demonstrated that where cows were visited more often during rearing they too had significantly higher milk yields. There were also indicators of better behaviour and reduced fear where the respondents' responses were linked to indicators of an improved relationship with their cattle. Our long term trial found that cows do indeed like being treated nicely by humans and there were improvements in the behaviour of the treatment group and this was linked to an increase in milk yield. How can you account for the higher production? Biologically? Conversely, how does fear produce poor milk production? Our suggestion is that a less stressed cow (one that is more relaxed around humans) is not producing cortisol (the stress hormone) which interferes with milk let down. Many breast feeding women can tell you about stress / worry and difficulty in milk let down. Evidence of the impact of cortisol on milk production has been found in many controlled scientific studies. We hope to be testing this hypothesis with some new cortisol tests. Is it the actual naming of the cow or just the positive human contact implied in the act of naming that makes a cow more productive? The latter. Psychologists believe that a human's attitudes are reflected in their behaviour. We suggest that inferred improvement in attitude towards cows will be reflected in improved behaviour around cattle. Besides the human factor, could there be any other factors that could have contributed to the cow's milking temperament? A number of factors can influence a cow's temperament (fear of new things - not just humans, previous experience, separation from her calf, pain or discomfort, the other cows and more). But in our experiments and the survey, we designed the trials or information collected to be able to cross check / balance for temperament. We hope to be able to explore tests for cortisol on farms and add more weight to the trial data and survey data (this relies on funding). There are a couple of other areas of animal welfare that we hope to get funding for. There is a new test being devised to assess an animal's state of mind in a variety of situations, it has been trialled on rats, birds and dogs. It is a way of assessing how the animal feels and measuring it scientifically. We hope to be able to assess pig housing on commercial farms based on this (for example do they still enjoy being free range when its freezing and muddy or would they rather be in a big warm straw yard inside, if they have experienced growing up outside, is it worse to then come inside compared wth only knowing what it is like to be reared inside?). They test of "affective state" is more sophisticated than traditional "choice / preference tests". Again we will be applying for funding and we hope that the students at Newcastle University, studying Animal Science and Agriculture, can join in with these projects.